Spring is here and that means that wedding season is starting to kick into full swing. 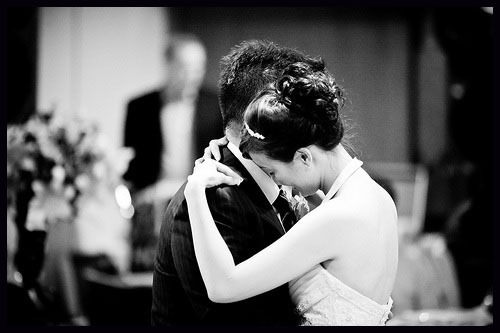 The big day is coming soon and now is the time that many couples start panicking about their First Dance. Some couples know what song they want instantly. Others can never seem to find just the right song. And regardless of what they will end up choosing, all of the couples just want to make sure they don't look stupid. It's easy to get into panic mode at this point. Everything is starting to snowball these last few months, and yes, it can wear on your nerves! But try not to let choosing your song become one of those annoyances. This should be a fun and special event for you two to do together. Yes, sometimes there seems to be a lot of pressure on that first song, but hopefully the following tips will help take some of that pressure off. If you already know what your song is then you're almost done! Now you just need to put together your dance. If you're going to work with a professional, try to give yourself at least a month or two to prepare. Those last couple of weeks get crazy and you don't want to be stuck trying to learn new steps at the same time. Other tips on making sure you're prepared for your first dance will be posted soon, so be sure to check back! If you still need to find a song, start by deciding what's more important to you: Are you looking for a song with words that are just right regardless of the type of music? Or, do you want a certain sound (i.e. : slow & romantic, big band, Latin style, show tune, dramatic, rock, etc.)? Or maybe you know you want a certain style dance - like a tango, swing, or waltz. Once you decide what aspect is most important to you, you can narrow down your search. If it's only all about the words, then buckle up - you've got a long ride ahead. There are so many great songs with meaningful lyrics, but only you will be able to tell if they mean something for your relationship, so you're going to have to sit down and listen to a lot of different songs to try out the lyrics. If you want a certain sound, you can plug that style in to a YouTube or iTunes search to get a good starting point. Then work your way down the list to find something that fits the feel you're going for and will meld with the theme of your wedding. If it's all about the dance, then you may want to talk to a local studio, dance teacher, or professional dancer. They work with a plethora of music and will be able to give you an idea of what kind of music will work best for the type of dance you want. Here is a link to a good starting list to look at from a local studio. There are, of course, many more to choose from - this is just a sample to get you started. Don't know what the heck you want, but do know you want to do some kind of dance? Then you might want to schedule a time to meet with a teacher in your area. You can use your first lesson to hear different types of music and try out a couple of basic steps for different styles of dance. This will give you an idea of what feels more comfortable to you, or what you think may flow with your special day the best. At that point, you can go home and search through that kind of music only and it'll be much easier to find a suitable song. It sounds stupid, but the key is to relax. Chances are, unless you know a composer, you probably won't find a song that is absolutely perfect in every word, tone, length, style, etc. But if you decide which aspect is most important to you, you'll be able to make the rest of it work. You don't want to get too stressed out about it and make it too much of a chore. That will show in your dance if you do, and no one wants to watch that. Remember, your guests likely are not going to remember the song itself, but they will remember watching you dance if they can see how special the moment is to you. The most important thing is that this is the first time you get to dance together as a married couple. It should be all about this private moment between the two of you (forget about the fact that all your guests will be watching). All the planning, stress, craziness, stops for this 2-4 minutes while you get to do nothing but dance, hold each other in your arms, and celebrate your lives finally becoming one. That moment is a memory you can't re-do, so enjoy it. Treasure it. It doesn't matter if the music is perfect. That one moment between you two is all that's important. The rest will come!